JOSHUA MAASSEN / The Journal During “Dream Week” members of the Webster University community honor Dr. Martin Luther King day in a March on Webster Jan. 17, 2010. Leaders of the march periodically stopped around campus to recite selected speeches of Dr. King. Students celebrated Martin Luther King Day on Webster University’s campus by marching and reading the famous “I Have a Dream” speech. The March on Webster was part of Dream Week, a series of events sponsored by MCISA and organized by WebsterLEADS. Dream Week commemorated the 25th Dr. Martin Luther King Day. Bernard (Bernie) Hayes, a professor at Webster University, concluded Dream Week’s March on Webster with an inspirational speech concerning topics that Dr. Martin Luther King fought for. Dream Week acknowledged King’s hard work, highlighted the power behind marching and featured one of his many influential speeches. Reflections on King and Hayes’ interpretation of him and his dream inspired attendee Kemi Olaswere. “[Hayes’ speech] motivated me to believe in myself, that I can be who I am, and encourage the next person to be who they are and who they can be,” said Olaswere, a sophomore early childhood education major. Hayes also reflected on King’s influence during the civil rights movement. The idea for this event was created during the Advanced Leadership Retreat, which included various student groups. Frank Hartfield Jr., a senior speech communications major, attended the Advanced Leadership Retreat and was positive with the response that the March on Webster received. When asked about how King would feel about society and government today, Hayes said he believes King would be overjoyed about President Barack Obama. Laura Beth Eschbacher, a junior media communications and German double major, was on the service project planning committee and would like to see Dream Week participation grow in the future. 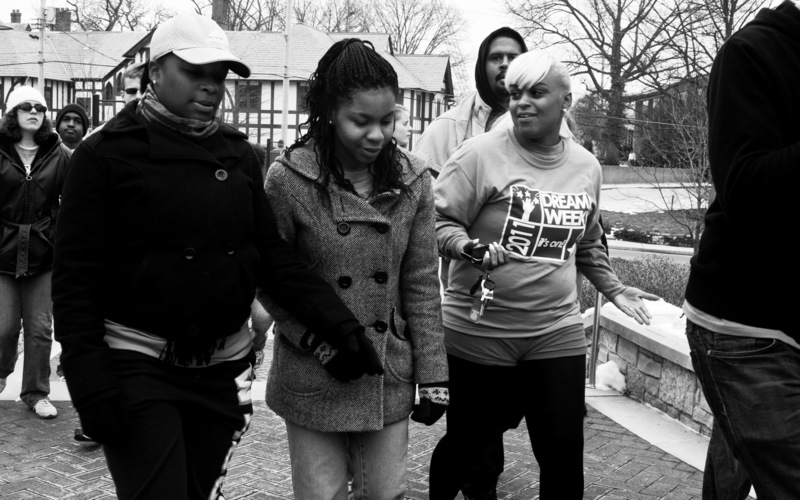 After the march and discussion with Hayes, volunteers participated in a day of service. Participants created take-away meals for St. Patrick’s Center, an organization that provides meals to the homeless and those at risk to become homeless. Sandwiches, trail-mix, cookies and apples were put together by students and dropped off at St. Patrick’s to be served the next day. Webster traditionally holds events to commemorate Martin Luther King Day, but this is the first year the campus has participated with the national day of service. Thursday will conclude Dream Week with a panel discussion titled “Keeping the Dream Alive: What Can Webster Do?” The event will be held at 6 p.m. in Sunnen Lounge.